A march by students, parents, teachers. and others took place before Wednesday night’s School Committee meeting. Dismayed by spending cuts for special education programs, 11-year-old Gabriella DeLeon joined more than 100 other students, parents, teachers, and advocates to march in protest Wednesday from the South End’s Blackstone Elementary School to School Department headquarters in Dudley Square. 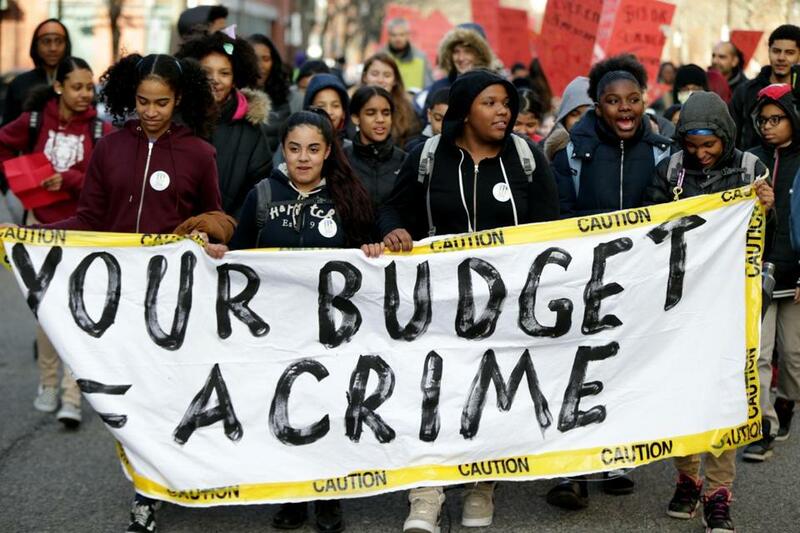 The march, which drew supporters from across the city, came hours before the seven-member Boston School Committee voted unanimously to approve a $1.14 billion budget proposal for next school year. Some committee members said they reluctantly supported the proposal. But under the city charter, if they didn’t approve it, the original budget unveiled last month, which provided less money to individual schools, would have become the final proposal. “It’s hard to justify cuts in core services at some schools,” due to declining enrollment, said Michael O’Neill. “We could be doing better,” said Lorna Rivera, whose fifth-grader attends Sumner Elementary School in Roslindale. Though the budget would rise by more than 2 percent — and still doesn’t include increases yet for teacher raises, which are being negotiated — dozens of schools will see declines in funding due to enrollment drops. The school system distributes money on a per-pupil basis, creating winners and losers, depending on enrollment increases or declines. Eleanor Laurans, the chief financial officer, said the district each year adjusts school allocations. “I think we are here because we all want more for our students,” she said. Interim Superintendent Laura Perille said since the budget proposal was introduced last month an additional $3.2 million has been funneled to 53 schools. They poured into the School Department, where they held a mock School Committee meeting. “Will we approve the current BPS budget?” asked more than a dozen protesters who sat at the School Committee table. “No.” They then approved a budget they deemed suitable. They dubbed themselves the People’s Committee. Councilor Lydia Edwards said in an interview that schools in East Boston and Charlestown, which she represents, will see $2.6 million in cuts. “It’s a huge wallop to the schools,” she said. The budget proposal calls for some new investments, such as a half-million dollars to bolster family engagement; an additional $750,000 for efforts to turn around low-performing schools, pushing overall funding beyond $2 million; $375,000 to improve science instruction in grades 3 to 8; and $350,000 for efforts to help high-schoolers identify and develop career skills. The proposal also calls for spending $364,000 on a new effort that would allow sixth-graders to take the Independent School Entrance Exam at their school during the week next fall, instead of going to regional sites on a Saturday. Many students miss out due to a lack of transportation or family issues on Saturday. The money covers the exam fees, proctors, and family outreach. The School Committee vote, though, is not the final step. Mayor Martin J. Walsh will incorporate it in his spending plan for the city for the next fiscal year and will submit it in coming weeks to the City Council for approval. Walsh intends to boost school spending further with free MBTA passes to all students in grades 7 to 12 instead of just those who live far from school. A cost estimate has not been generated yet.